Home » Activities for Education and Awareness! Kids for World Health recommends the constructing of games and activities to learn educational information and facts about our targeted neglected diseases. 1.One of our chapters created a Jeopardy game with questions that were relevant to their monthly learning of disease facts. 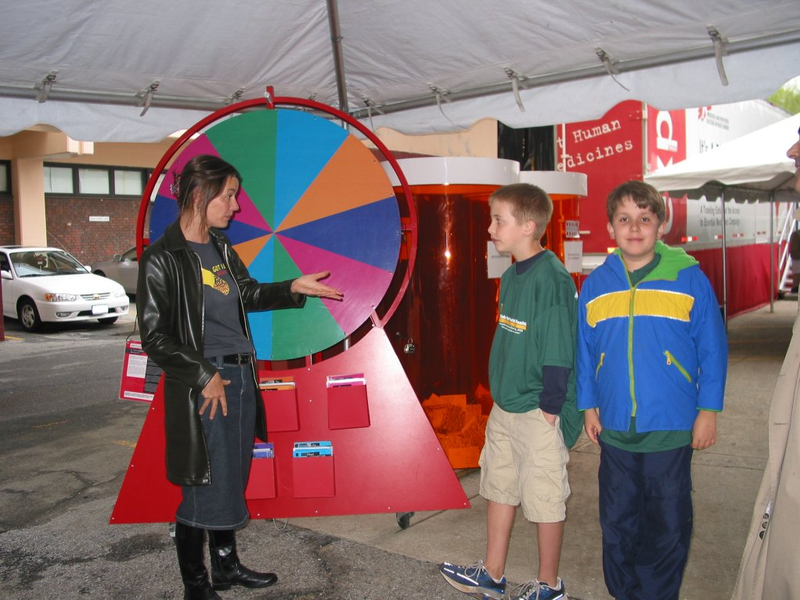 2.The Founders of Kids for World Health replicated an exhibit called The Wheel of Misfortune, as seen above, initially created by Doctors without Borders for their Access to Medicines Campaign. A spinning wheel was constructed with color- coded spaces. Community members were asked to spin the wheel to get the color and symptoms of their disease. Some of the diseases were our targeted diseases, and some were diseases like Malaria, TB, and HIV/AIDS. Students did research on the diseases to acquire all information. Next,” patients” were guided to the exhibit area where informational posters of the diseases could be read that described some symptoms, effects of the diseases, treatments, and global health statistics. “Patients” were asked to guess what disease they had. After consultation with the “doctors in the field”, played by white-coated students, they were guided to a table where available optimum treatments were discussed. This activity ended positively for the patients, with a few words of how treatments are not necessarily available for the world’s poor. There were facts presented, however, in the progress that has been made. The evening also included a noted speaker on neglected diseases, with a Q and A . The community enjoyed the evening and we collected dollars for Donation to our yearly goal! From Education, comes passing of Awareness to others! Please Contact Us about what has been fun and has worked for you!